Play Red Hot 20 online for free now! What's your favorite fruit? Cherries, melons or juicy oranges? 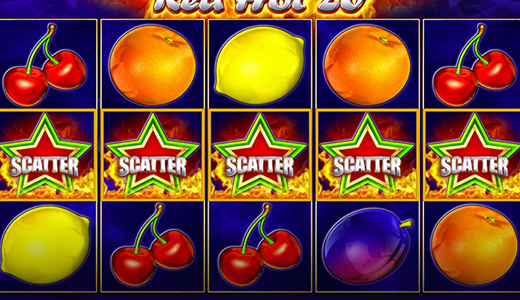 The well-designed fruit slot Red Hot 20 with 5 reels and 20 fixed win lines will appeal to players who like plain but gripping gaming action. Keep your eyes peeled for at least 5 adjacent identical symbols on one of the win lines running from left to right. A winning combo has to start on the left reel and contain at least 3 identical symbols every time. Therefore, symbol combos beginning on reels 2, 3, 4 or 5 are not valid. The 7 acts as Wild symbol and can substitute for any other symbol (except for the Scatter symbol) to complete winning combos. Winning combos with Stars (Scatter) generate many Twists for you regardless of their position on the reels and will also be added to line wins. Feeling a bit hot under the collar? No wonder, because Red Hot 20 is a reel extravaganza that is out of this world. Check it out for yourself and get carried away by this simple but ingenious slot game!